So – Here we are on the first day of the second decade of the 21st century. Sounds impressive, especially when I have spent so much of the last two years looking back into the last two centuries. It boggles my mind that I have had the privilege of talking to a few people who were born this decade in the 1900’s. Therefore, it seems an appropriate time to start to look back one more time before looking forward again. I started 2009 with a list of goals, both career and personal. I want to see what I achieved, what changed and set goals for 2010. I divided this up into two posts – both posted today in order that we don’t get scrolling injuries! Well – I certainly challenged myself this year artistically, trying to push my style – refine it. New mediums and materials? Not so much. Not yet. These were on my priority list. 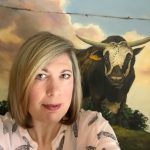 I started an e-newsletter, started to use my FaceBook account, built a FB page, started networking on Twitter (which turned out to be more of a resource!). 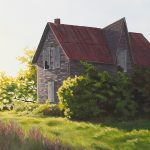 I improved my local connections with media and collectors and have put together packages for the people who buy my paintings. 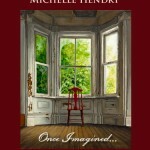 I was accepted into the last McMichael Exhibition and Sale against the odds and sold well. Overall I met and exceeded most of my goals on this list – but I still have so much to learn. I redid my website, making it much easier to navigate and contain considerably more information. The attention it has gotten, along with this blog, would indicate I achieved this. But, I can always do more for my readers and my collectors. Time to raise the bar. Hmmmm. This is a tough one and probably not specific enough. I did take a new approach to my painting process and found great stories along the way. I am not sure if that was innovative, but, it is not commonly done this way in my genre. I leave that one to you to decide. I developed a whole new online community for myself and in the process, I ‘met’ many like-minded and talented people. I learned a fair bit about social media. I also started an e-newsletter with things just for those who subscribe. I plan to improve on those features – including some very exciting stories! I did this in spades! A trip to PEI and many visits into the homes and communities that are the subjects of my work helped me achieve this one and more. I spent a lot more time doing drawings for my work this year. My camera has been acting as my composition tool more than ever due to some difficult sites to work at. As for writing – the blog has been as active as ever and I have started a book on the last two years’ travels and stories. It is both a portfolio of paintings and a record of rural and architectural history, I plan to publish in Autumn 2010. I went on a crazy William Blake phase, started to read more literature – mostly contemporary and mid-20th century – discovered Jane Urquhart. I have been sharing every story I can find. I am not much of a teacher, but, I hope I can add my bit to the craft of storytelling. I actually take longer!! In refining my style, I have had to take more time and have more patience with the process. The attempt to speed things up was actually an exercise in frustration. Not ready for that yet. Enjoy every minute I can get with my friends and family – of course! I spent much more time with friends and family this year and that was great! I found my spirit wandering the rooms and hallways of abandoned houses this year, silently communing with the spirits of those long gone as well as talking with those still with us who once walked those spaces. Over the course of the year, my imagination has been fired up and will hopefully give even more in the coming months. I have been in one of those modes where I feel a transition on the horizon. I am not certain at the moment how it will take shape. I was better at this early in the year, but, the last half was a lot of work and very little play. I tried to get my fun in there too, but, I hit up against physical limits and lost my sense of balance. I now realize that I didn’t have to accomplish everything this year. Got to make more room for FUN in 2010! I am inclined to say that I think I did pretty well in 2009. I set some difficult goals and some of them I surpassed even my best hopes, and others have left me re-examing my intentions. I even accomplished things that were not even on the list. Overall, I think I accomplished a lot. So where do I want to go from here? Sounds like you had a good year, and lessons learned and a willingness to share all which is greatly appreciated by me. Thanks. Would love to hear more on William Blake, which makes me think it’s time to do my own reading.